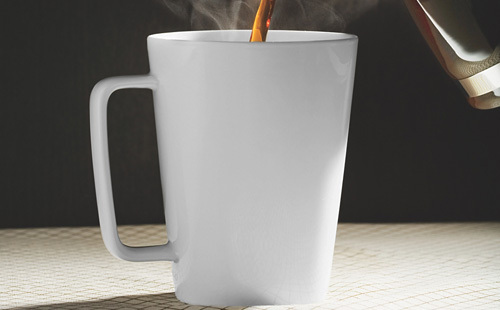 A cup of joe jolts your mood, reduces disease risk, and adds a kick to workouts. A morning cup of coffee is a must for many runners. It wakes you up, energizes your workout, and—how can we say this nicely?—gets your systems moving, too. But there’s more reason to indulge in that second or third cup. The latest research shows that drinking coffee is a (mostly) healthy habit that may make you happier and less stressed, and reduce risk for diseases. Caffeine isn’t the only beneficial compound in coffee—it’s also a rich source of antioxidants, which means decaf drinkers benefit, too. Researchers from the U.K. gave cyclists and triathletes a drink with 350 mg of caffeine, coffee with an equal amount of caffeine, decaf coffee, or a placebo drink. One hour later the participants performed a cycling test. The caffeine group and regular coffee group performed equally well—and both were faster than the placebo and decaf groups. Arabica coffee beans are rich in antioxidant compounds called caffeoyl quinic acids. One study showed consuming three cups of Arabica coffee daily for four weeks can lower markers for oxidative DNA damage. According to a National Institutes of Health study, adults who drink four cups or more of coffee daily are about 10 percent less likely to be depressed than non-coffee drinkers. A recent study from the Harvard School of Public Health suggests that drinking two or more cups daily of caffeinated coffee significantly lowers the risk of suicide. Scientists think caffeine may work as a mild antidepressant by impacting neurotransmitters, such as dopamine. A study review published in the journal Circulation found that moderate coffee intake (three to four cups a day) is associated with a significant reduction in heart-disease risk. And a recent animal study suggests that coffee may positively impact blood vessel function and bloodflow. A meta-analysis in the European Journal of Nutrition stated that for every two cups of regular or decaf coffee you consume per day, your risk for type 2 diabetes decreases by 10 to 12 percent. The greatest risk reduction is in drinkers with healthy BMI, which means coffee may help already-slim runners ward off the disease. Research shows that the antioxidants in coffee may help protect the brain from cognitive loss and delay the onset of Alzheimer’s disease. For two to four years, researchers tracked participants who were 65 and older and had mild cognitive loss. Subjects who averaged about three cups of coffee daily over that time frame did not progress to Alzheimer’s, while those who consumed less than that amount were more likely to develop the disease. A review of liver disease research shows that consuming one to two cups of coffee (not just caffeinated beverages) per day can protect this organ, especially for those at risk of poor liver health, such as people who drink more than two alcoholic beverages a day. Take a whiff of coffee and you’ll likely feel better. That’s because coffee contains volatile aroma compounds that affect mood. When mice undergoing maze testing are exposed to these compounds, it reduces their arousal level, exerting an antianxiety effect. Want to get your coffee fix from fancy drinks? Click play below to watch the Quick Bites episode on how to cut calories in your favorite coffee based drink. Is this 97-year-old fitter than you?